I’m a first-time mom and proud to say I was able to have an unmedicated, natural birth. I changed providers in week 36 to one who was more aligned with my wishes and I’m so glad I did!!! Best decision even though the practice was 2 hours away from my home. My hope was to have an unmedicated, natural birth. I took Hypnobabies classes around the 27 week of pregnancy with instructor Jenny Bennett (if you’re in the DC area, I highly recommend her!). And I followed the program, including the maintenance portion exactly as outlined, never missing a day of practice. I started having manageable waves (Hypnobabies word for contraction) two days before I went to the hospital, which grew stronger. I birthed at home for a while, listening most often to the Deepening track (Hypnobabies hypnosis track to deepen hypnosis), which helped me to be calm and relaxed. When my pressure waves were regularly 3 minutes apart, my husband drove me to the hospital, which was at midnight on November 15 (40+1 weeks). I was 5 cm dilated and my midwife had me move around in different positions and try the shower and tub. After 3 hours, I was 7 cm dilated and my water broke. 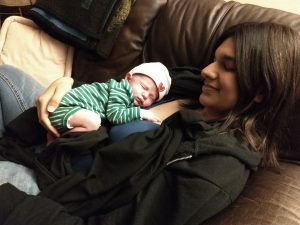 Unfortunately, my birthing time stalled at 7 cm and my baby was sunny side up so my midwife had to turn him (this was the most uncomfortable part of my birthing time (Hypnobabies word for labor)). After trying natural solutions to get my waves closer together after the stall, I had to get a low dose of Pitocin to get them restarted. This worked well and I was still able to listen to my tracks and manage any discomfort. Throughout my birthing time, the Deepening track was my favorite, as well as the Special Safe Place track (Hypnobabies track that guides you to a special place of your choosing with your baby). I actually preferred these tracks to the Easy First Stage track (Hypnobabies main birthing day track) so I listened to them on a loop. During transformation (Hypnobabies word for transition), I never felt the urge to push, so I unfortunately ended up on my back and needed some coaching. But after 40 minutes of pushing, I gave birth to my little boy Kiran at 11.19am on November 15! He is strong, but little at 6lbs, 3oz. I believe Hypnobabies helped me to have an unmedicated and natural birth with minimal intervention. I followed the program completely, which I think helped me to manage the pressure waves, but because I didn’t have an urge to push, I found I needed other mental strategies for the pushing phase. Overall, Hypnobabies gave me confidence, kept me calm during pregnancy and my birthing time, and gave me a good understanding of the benefits and risks of different procedures. My husband was wonderfully supportive which also helped! He was on board completely with Hypnobabies, reading the scripts, and adopting the language.